West Meade Elementary students with "Noah and the Arc"
Students and teachers at West Meade Elementary School celebrated the gift from the West Meade Conservancy (WMC) of a set of local books, “Noah and the Arc,” a true story about how one boy inspired the West Meade community to protect local woodlands for the future. The book is educational and includes beautiful photos of plants and animals taken by residents of West Meade. 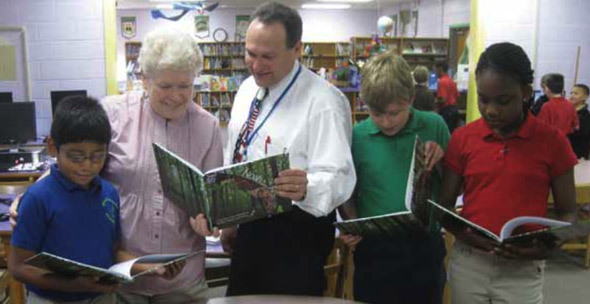 Donors financed a class set of 25 books for Karen McIntrye, librarian at the school, to use with students. West Meade Conservancy members Joanna Carnahan wrote a set of questions for the children to ask and Jane Bibring is helping them with tree identification. Members of the West Meade Conservancy executive council are President Alys Venable, Vice-President Dan Lindstrom, Secretary Jane Bibring, Treasurer Sharon Charney, Development Committee Chair Cindy Smythe, Education Committee Chair Joanna Carnahan, Publicity Committee Chair Kim Matthews, and Recruitment Committee Chair Nancy Smith. “Noah and the Arc” costs $16.95 (local delivery) or $19.94 if mailed. A class set of 25 books is $420. The organization’s website currently is being restructured and the best way to order books now is by sending a check to the WMC’s P.O. Box (The West Meade Conservancy, P.O. Box 58406, Nashville, TN 37205) or through Joanna Carnahan at 352-5406 or jec614@att.net. Pictured are: Esquiel Tapox, Librarian Karen McIntyre, Principal Stephen Breese, Josiah Nodruft, and Efe Ekundayo.